Sugar Gamers readers, please allow me to introduce you to a woman who inspires me as a Halo fan, the utterly fabulous Lena Sänger. This woman flaunts her abundant knowledge of the Haloverse like no one else. She founded Fist of the Unicorn (fistoftheunicorn.com) which is fun romp through all the games she’s been playing along with a healthy dose of Halo fandom. The site also contains all of her Girls Love Halo interviews with tons of fabulous Halo loving ladies. I’m really excited Lena found the time to geek out with me about my favorite game franchise of all time. Rebecca Rothschild: What is it about Halo that stands out to you? Lena Sänger: Most definitely the lore. The Halo story is so rich and exciting. If you only play the games you are missing out, big time. The relationship between Chief and Cortana is so special. Then there is the music. Outstanding work from Marty O’Donnell up to Halo Reach. I mean can you think about Halo: CE and not hear the monks chant in your head? I cannot. Overall the campaign from Combat Evolved is what stands out to me. Every chapter is brilliant and filled with memories to me. RR: I know it’s hard to pick just one, so can you give me your top three Halo characters and why they make the list? LS: Chief is first, because he’s Chief. Cortana is second because she’s Cortana. I cannot not pick them. They are what makes Halo my favorite game of all times. The third pick is going to be real tough though. A Flood Form maybe? Halsey? Hmmm…I think I am going with Serin Osman, Chief of ONI. She is a very interesting character since she was part of the Spartan II program with the Chief. She washed out of the program and became part of ONI and the protege of former Chief of ONI, Margaret Parangosky. Her story is told in the Kilo-Five trilogy by Karen Traviss. RR: Can you describe your path to gamerhood? First game you played? First console? LS: I really became a true gamer in 2002, when my boyfriend introduced me to Halo: Combat Evolved. Until then I had only played classics like Tetris, Super Mario and Indiana Jones. 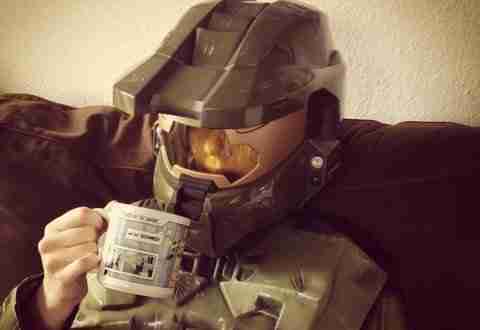 But my passionate love for games sparked with Halo. My first own console was a Xbox 360. Besides Halo, I really took a liking to the Riddick games, Fable and Half Life. RR: How has your relationship with video games changed over the years? LS: I would say I am still evolving as a gamer. The older I get, the more interested I become in gaming. I listen to gaming podcasts, read articles and watch shows. And the games I play are more varied. I love story driven games like Life is Strange or Fire Watch and smaller Indie games like Valiant Heart or Child of Light. I used to only like FPS. And I still do. OH, I do! But overall I would describe myself as more open-minded. RR: You’re running Girls Love Halo and Fist of the Unicorn. Any future projects or news you’d like to discuss? LS: Since I have a kid and a job I have very little time at the moment. I am happy if I post one article on my blog every week and play a game now and then. Girls Love Halo is easier to maintain since it doesn’t take too much time to create a post. But yeah, I’d love to be more involved with my blog and connect with other like minded people. I can’t thank Lena enough for this interview and letting me get to know her a little better. You can find her on Instagram @youcametomelikemasterchief and @girlslovehalo. You can also follow her on Twitter @fistotunicorn.